Note the time on the phone display. Now that it’s done Razer-ing the hell out of PC and console gaming, Razer is turning its attention to mobile. 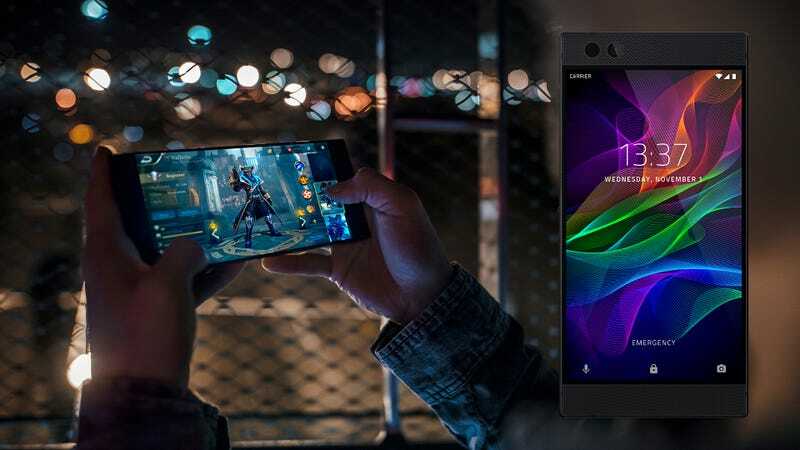 Launching on November 17, the $700 Razer Phone features a Qualcomm Snapdragon 835 chip, 8 gigabytes of RAM and the world’s first 120 Hz “UltraMotion” display. Candy Crush is going to run so well on this. It’s code name was Project Cheryl. Hey, Cheryl. Though certainly strong enough for Candy Crush Saga, the Razer Phone has been engineered with high-performance mobile gaming in mind. Compared to other mobile devices, its specs are downright ludicrous. What phone needs 8 GB of RAM? Which games are going to take advantage of a display with a variable refresh rate up to 120 FPS? I get the front-facing stereo speakers and THX-certified USB 3.0 audio adapter—you want good sound while watching Netflix or showing friends funny things on YouTube. But you don’t need Qualcomm’s most powerful system-on-a-chip to do that. This is a device that’s all about playing video games. Having already covered the PC and console esports scene with glowing green squid logos, Razer aims to be the go-to device for competitive mobile games as well. These games include Tencent’s upcoming Arena of Valor, the five-on-five arena game that’s been racking up tens of millions of concurrent players in Asian territories as Kings of Glory. Tencent’s MOBA is one of several gaming partnerships—games specifically tailored to take advantage of the phone’s capabilities. Others include Netmarble’s massively multiplayer Lineage 2: Revolution, Madfinger shooter Shadowgun Legends, and Square Enix’s Final Fantasy XV Pocket Edition. Gaming or not, the Razer Phone is an impressive piece of Android hardware on paper. The 8mm-thin rectangle will come loaded with Android Nougat, ready to upgrade to Android Oreo when the spring rolls around. It also comes preloaded with the Nova Launcher Prime, which is rapidly becoming the go-to application for people who don’t want to look at whatever garbage their mobile carrier put on their phone. While the standard edition comes with a subdued silver Razer logo, there’s a limited special edition for those green fiends in the audience. Of course a mobile phone is just a tiny tablet without a cell carrier of some sort. In Europe the phone is exclusive to Three at launch. In North America it’s T-Mobile and AT&T. And while it certainly looks like it’s capable of gaming, how it handles phone calls is still an unknown factor. Hopefully I can get my hands on one before launch to try it out. The Razer Phone will be available for preorder today at Razerzone.com and Three in Europe, and will be available on Amazon and select Microsoft stores across the U.S. when it launches on November 17. Suggested retail price is $699.99 (€749.99 / £699.99). So, what do you think? Is it time for more powerful mobile gaming hardware? Is it fair for a player running on hardware optimized to run at upwards of 120 frames-per-second to fight against players on three-year-old phones with cracked screens? Where is the Chroma lighting? Can we add Chroma lighting so the phone is in sync with our mice and keyboards? Most importantly, what the hell is this guy doing?